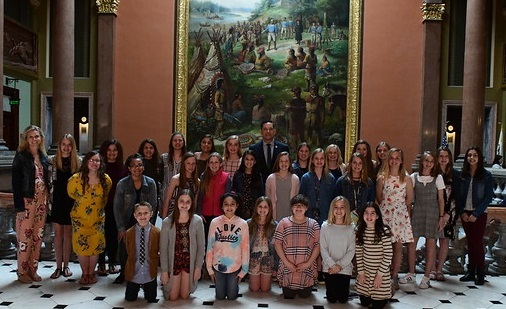 Last week, State Representative Tim Butler (R-Springfield) welcomed the 7th and 8th grade girls basketball and volleyball teams of West Lincoln-Broadwell Elementary School to the Capitol to congratulate them on their recent state championship victories. In honor of their accomplishments, the Illinois House adopted a series of resolutions to recognize each team. 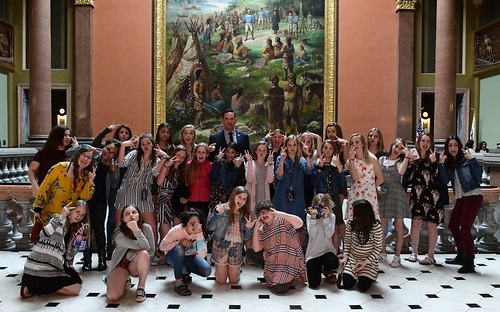 Rep. Butler with the Lady Wolverines of West Lincoln-Broadwell Elementary School at the State Capitol.